The DT-V17G25 reproduces highly accurate colors in native 1920 x 1080 resolution. The two most critical factors, gamma and grey-scale gradation, have been improved to meet the demands of production studios and broadcast networks. The monitor offers 3 gamut modes: ITU-709 (default), Adobe and User (DCI). 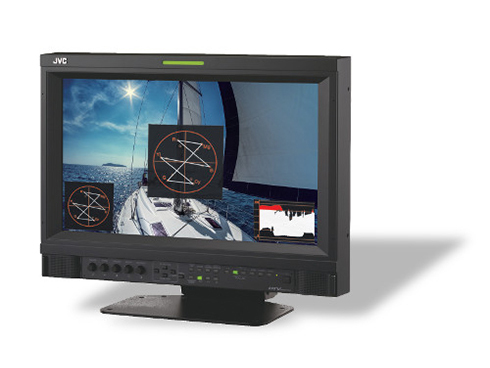 The DT-V17G25 is a near EBU Grade 1 LCD monitor. In addition to color gamut, luminance ranges and color temperature that meet EBU specs, two critical factors — gamma and grayscale performances — were also improved to satisfy the discerning requirements of studio and professional applications. The DT-V17G25 is equipped with a 10-bit IPS LCD panel, which surpasses the EBU Class 2 requirements in terms of color space, gamma and gradation. It is capable of reproducing 1.073 billion colors. It also offers a contrast ratio of 1500:1, wide gamut, and wide viewing angles of 178°/178°. help eliminate aliasing to make pictures appear more natural. *Annual energy consumption figures are based on the power consumption of the monitor operating 4 hours per day for 365 days. The actual energy consumption will depend on how the monitor is used.